Cuts and strip wires, crimps ignition terminals. Easy-to-read wire size markings. Helps to align multigang installations of 2 gangs or more. Wall plate fits without additional adjustment. Adjusts to any combination of toggle, decorator and duplex. Built-in bulb level. Includes spring return and lock. Adjustable, hardened spring steel. Strips 10-24 gauge wire. Heavy cream-like paste. Slides on smoothly and clings throughout the pull. Excellent abrasion protection and cling ability, repels water to some extent. Modified wax base formula dries to a slippery film. Greaseless, non-toxic, will not stain skin, clothing or construction trim; cleans up with soap and hot water. Withstands normal temperature extremes and will not dry out in the container. Remains stable with 3 freeze-thaw cycles. Non-combustible, non-conductive and non-corrosive. Will not damage conduit or insulation. Suitable for fiber-optic wire. Yellow color. In a squeeze bottle. UL Listed. Tests standard receptacles and extension cords to ensure proper wiring. Neon indicators give positive indication of circuit status. Compact unit simply plugs into any standard 3-wire/grounded receptacle or extension cord (110 /125 volt circuits). Tests for six circuit conditions: open ground, open neutral, open hot, hot/ground reverse, hot/neutral reverse and correct wiring. Yellow and red lights provides indication of circuit status or specifies wiring errors. Strips UTP and STP cable up to .24" (6.2mm) OD. Tension release lever, compact design. For use on CAT 3 and CAT 5 cable. Carded. GB Cable Ripper, Premium, 14 - 6 AWG Cable/Wire, 4 in Overall Length, cULus Listed, For Use to Cut Off Cable Jacket Tests for breaks in non-energized wires or cords. 360 degree visual indication. Durable, heavy-duty tip. Flexible lead with insulated alligator clip. Pocket clip. Operates from 2 AAA batteries (included). Large, dual, neon indicators acknowledge presence of voltage. Individual indicators for each voltage range assures reliability of testing. Probes snap on bottom of housing for single hand testing of outlets. Insulated leads and housing. Tests from 100 to 300 volt AC/DC. UL Listed. Three-way live circuit tester indicates 120, 240 and 277 volt AC. UL Listed. 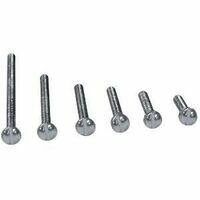 Contains assorted sizes and lengths of commonly used electrical screws. Screws are #6 - 32, ranging from 3/4" to 3" in length. Tests ground fault breakers by overloading circuit and tripping GFCI. Plug tester into any ground fault receptacle (110-125 volt AC) and press black button to overload circuit. Tests for seven conditions; ground fault interruption, open ground, open neutral, open hot, hot/ground reverse, hot/neutral reverse and correct wiring. Yellow and red lights provide indication of circuit status or specify which wire is defective. Carded. Fits the majority of UL locknuts. Etched markings allow for easy identification, clearly marked tighten and loosen ends. Thin design allows easy maneuvering in tight locations. Durable steel construction. Hooked tip latches onto locknut and maximizes turning leverage. Strips cable, 10-22 AWG wire, crimps terminals and cuts bolts. Easy-to-read wire size markings. Shorter for better access to tight spaces between studs and joists, will drill 2' and 4' joists. Self-feeding screw point draws bit through all wood types. Replaces special tools such as right angle drills and eliminates multiple steps to cut the hole to size. Overall length 4.5" (144mm) weight .3 lb. (118g). 1/4" hex. Over center single flute design for cleaner holes and less splintering. Marked with bit diameter and catalog number on shank for easy identification. Not for use in wood with nails.